1) Do not eat more than 1 large melon in the span 5 minutes or else you will end up in the fetal position trying to coax gas out of your intestines. 3) Pulling out the grill is one of the simplest and best ways to enjoy an excess of summer squash and eggplant. 4) Do not lament the end of summer if it gets chilly for a couple of weeks in August- there will be heat to come yet! 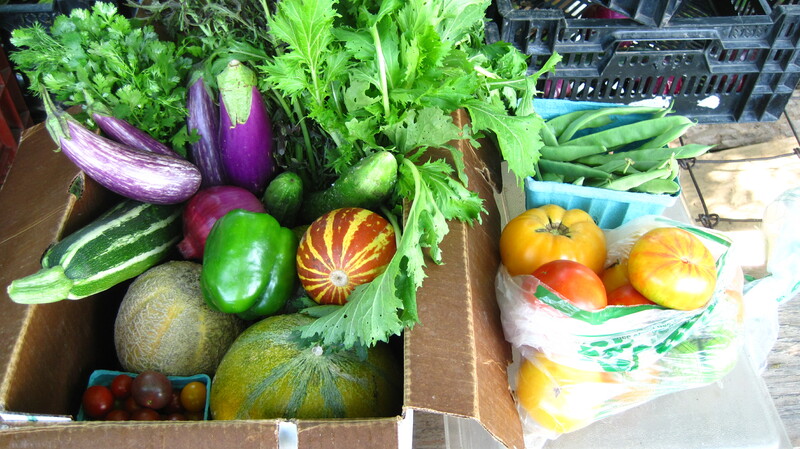 5) There is no better problem than having trouble closing a CSA box. Cilantro or Basil (don’t worry, those who do not receive cilantro this week will receive cilantro in a coming box (barring any unforeseen unfortunate happenstances)). If the bunches of Mizuna and Ruby Streaks seem familiar to you, it’s probably because you’ve eaten them before as part of our spicy salad mix. I personally like to include them raw in a salad, but confess that their flavor can be at times overwhelming if there aren’t some milder greens involved. If this is the case for you, including them in a light sauté with onions and garlic is always a good plan, as is tossing them in any stir fry at the end to cook a bit in the residual heat. The trick to cooking them without killing them is removing them from the heat source just when all the leaves have started to turn a bit soft. There are two recipes I’d like to include this week, both from the book “From Asparagus to Zucchini: a Guide to Cooking Farm-Fresh Seasonal Produce” by the Madison Area Community Supported Agriculture Coalition (MACSAC). A great book for any CSA member to own, by the way. Tips on storage and cooking are included for all the vegetables you will receive in a box, as well as recipes for them. 1 sprig rosemary, leaves torn off the stem. Heat olive oil in deep pan over medium heat. Add garlic and pepper flakes; sauté until fragrant. Add onions; sauté until translucent, 3-5 mins. Add 1/4 cup water, the dried spices, and green beans. Stir cover, and steam cook until the beans are nearly done- 10-15 mins. Stir in the rosemary and tomatoes. Cook very briefly until tomatoes are warmed through and beans are done. Season with salt, or, if you prefer, melt salted butter over beans before serving. All the eggplant we gave you! Cut off eggplant stems. Pierce eggplant several times with a fork. Place on baking sheet and cook in 350 degree oven until very soft- about 1 hour. When cool enough to handle, remove skin. Add garlic and ginger to the food processor first, then add the eggplant and whir until smooth. Finally, add the rest of the ingredients to the food processor (except for bread!) Serve with warm pita bread triangles. We hope you’ve been enjoying this peak season of fresh produce as much as we have, and that you have a very tasty week.